Do you have this mindset when marketing and selling your products and services? In this era of mobile technology, access to real-time information and instant connections is reinventing the way we think, behave, and react, giving us consumers more power to become more involved in branding, marketing, and selling of a product. This is why you have to go and be where the technology is going. Let’s take one technology such as QR Codes to illustrate. Do you know that they are great for adding to your marketing and sales mix? Don’t take my words for it; scan one of these codes yourself and see how great they are for building an opt-in list, selling a product or service, directing customers to a website like yours or a YouTube video, reading an RSS feed, sending a text message or email, inviting them to sign up for your event, or launching any app on their phone. You soon will discover the true meaning of QR Codes – to translate to instant contextual information that the customers reach out for via a simple symbol that specifically designed to transmit digital messages. So what’s a QR Code? It’s an abbreviation for Quick Response where its 2-D barcode consists of black square dots arranged in a square pattern on a white background. QR codes are everywhere. They are seen on posters, flyers, stickers, the internet, printed on ads, on TV (like The Weather Channel), on brochures or collateral, in newspapers and magazines, in library catalogs, in product packaging, in business card, storefront or window displays, and other merchandises as well as in retail stores and outlets, museum exhibits, and airports. Everywhere! You’ve probably seen local businesses throughout the US with QR code window stickers (QR business decals), courtesy of Google. Google’s Favorite Places allow customers to read and leave reviews, find special offers, and star the business. 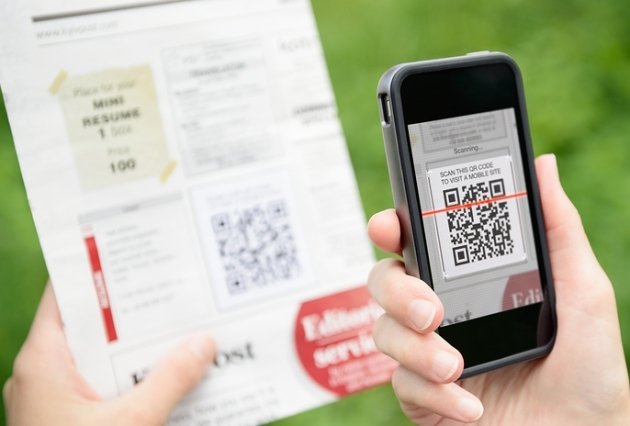 The QR Code’s concept is simple: customers scan the code with their smartphone. They are then directed to a website, contact information, a map of the street address, click-to-call or click-to-SMS, or other call-to-actions like sending a text message, dialing a phone number, getting a coupon with an intent to purchase, sharing something on a social network, purchasing a product or service, and any functions that a mobile device can perform. Apparently, there’s a market for QR codes in an increasingly usage of smartphones; they are quickly gaining in popularity. According to comScore (June 2011), 14 million people, age ranges from 18-44 scanned QR codes at home or at retail stores. It’s an exciting time for you whether you’re a marketer, retailer, service provider, entrepreneur, art exhibitor, small business owner, large corporation, ad agency, etc. It helps you connect three major marketing channels: print, mobile, and web. There are other reasons to invest in QR codes. Provide immediate access to what’s relevant to customers. It’s your opportunity to bridge the real world and the virtual world to extend the user’s experience by engaging your customers on the go and provide quick, instant access to useful information to help them make decisions and get them moving. Link to your site. QR code is one of the best ways to direct your customers to your mobile commerce website, thereby, driving more traffic to your site. Use it to link to your product or service videos; thereby, helping to visually demonstrate to your customers what your brand is all about. Make sure your content is mobile friendly, related to the QR code context or the advertisement, and is engaging. Create virtual business cards (Vcards). This is another great use for QR codes, providing your customers and prospects with quick access to your contact information and company information. Transform static images into engaging, more dynamic and interactive brand experience. When used with your print ads, packaging, brochures, magazines, mailers, coupons, billboards, etc., it’s your opportunity to provide practical, exclusive, entertaining, and informative content to your customers. Thereby, it gives your customers a reason to interact with your brand, and ultimately establish and maintain a relationship with your brand. Follow other brands’ leads. Consider using QR Codes as a digital currency like Starbucks which uses them in their mobile app to allow customers to pay cash by scanning their phone; as a promotion like Clinique which uses them in an advertisement in magazines such as Vogue; as a philanthropic cause like Be the One campaign which uses them to help save the Gulf; and as a display of an in-store signage like The Gap promoting its collections. Check out your competitions and other non-competitors for inspirations and ideas for QR code marketing. How are they using QR codes? What’s the landing page once the code is scanned? How successful are they in marketing and selling their brand, promoting brand’s awareness, in establishing and maintaining customer’s loyalty, etc. What types of promotions are they offering their customers? Follow their leads and make QR codes part of your marketing strategy. There are a lot of inspiring QR code designs to capture attention and piqué interests. For example, check out Macy’s QR code for inspirational creativity – as part of Macy’s Backstage Pass program, its QR code is placed in the center of a star, providing a unique look to its brand. Use it in your mobile apps. Do you have mobile content that delivers information, satisfy customer’s curiosity, and connect them to your brand? Airlines such as Delta use a QR code in their mobile app to allow their passengers to do a flight check. Ikea uses it to provide extra information on its products. If you have a mobile app, make sure to use a QR code in your mobile app for call-to-actions or other customer’s incentives. A branded app should add value for your customers, helping them do things better and make decision faster. Focus on the mobile experience. Sure, the QR Codes give a high-tech feel to your brand, but don’t forget some of the fundamentals to a great mobile experience: know your customers and prospects, give them a compelling reason to scan, make it easy for them to find you and your brand, and make them want to return. This means don’t make them watch a commercial, for example, before they get to the intended message. Keep in mind the frequency of scanning a QR code depends on how often a code is seen, customer’s desire to scan it, and the ease of scanning. Don’t just use QR codes because they’re simple to use, easy to implement, and everyone is using them. Use them for the right reasons. Use them to serve your goals without sacrificing your customer’s experience. Don’t just show the QR code without any context. Customers want to know what they will see after scanning it. Adding a short descriptive context will let your customers know what to expect. For example, it can be something as simple as “Scan here to visit our website”. Use a QR Code to simplify customer engagements by providing them with useful, relevant information and incentives to thank them for interacting with your brand. Also make sure to test your code to ensure it works by scanning your printed code, testing with several readers and phones and all major operating systems, etc. To get started, you would need a QR Code generator to create your own QR Code. Simply Google it with the words “QR code generator”. There are plenty of free code generators to use; experiment a few to select the best one for you. Then, follow their as few as 3-step easy-to-create instructions to generate your code. Basically you would need to select your site, choose the type of object you want to create (URL, text, phone number, SMS), enter the information requested, and save the code. Depending on the generators you’re using, some allow customizable design options, unique color coding or custom colors, shading, etc. such as Microsoft Tags. Consider investing in paid generators which will provide better designs and higher quality. Once created, add it to your printed materials. Have you checked out any of the QR codes for ideas, suggestions, and inspirations? I’d like to hear your thoughts.